2nd Friday Art Walk. Take a stroll and see! March 8, 2019 Celebrate Spring! Venues open from 6 to 9 pm. Everyone is invited. Always free. Enjoy art on the walls of all the venues below. Visions By Shirl - 116 Hawthorn St.
C B Chamber of Commerce – 106 Hawthorn St.
Jarrett Thor Fine Arts and Artists' Alliance – 100 Taylor St.
Dockside Realty – 104 Taylor St.
Potomac River Fisheries Commission-222 Taylor St.
Coldwell Banker Elite – 233 N. Irving Ave.
Colonial Beach Brewing - 215c Washington St. 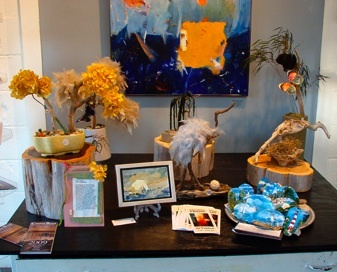 The once a month art walk event draws residents and visitors from all over the area who enjoy the opportunity to view a wide variety of artwork on display from local and regional artists while socializing with friends and merchants. 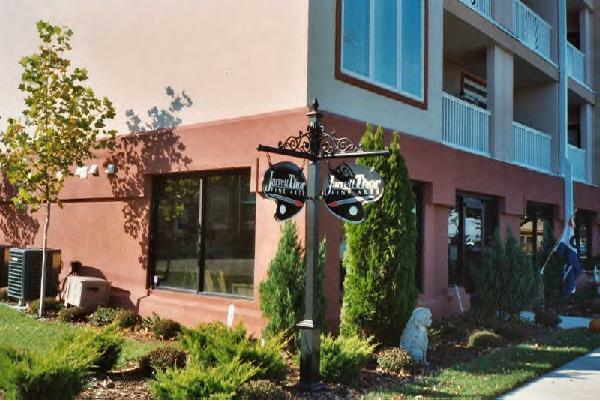 Commercial locations in Colonial Beach provide space to exhibit the fine workmanship. 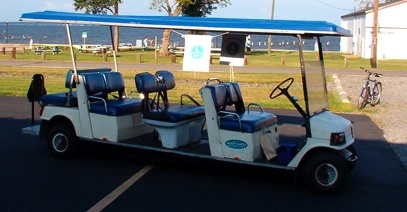 Many of the locations are near the Town Commons and include local shops, Bed & Breakfasts and restaurants. Brochures, maps and information are available at each participating location. Held year-round the 2nd Friday of each month from 6:00pm - 9:00pm, admission is free, and free parking is readily available on the street and in several local lots. 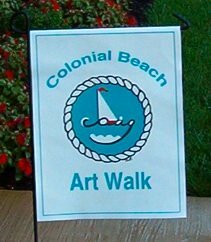 The Art Walk is sponsored by the Colonial Beach Artists’ Guild in cooperation with area merchants. Their mission is to bring more visual arts to the community and offer educational opportunities, while sharing interests and having fun. NOTE: The route and venues vary, so be sure to pick up a current map at one of the stops for that month's featured artists and locations. 1. Potomac River Fisheries Commission bldg, 222 Taylor St.
3. Pottery By Hand and the adjoining Studio A at 10 & 10A Hawthorn. 4. Riverview Inn motel on Hawthorn. 5. Esco Limited on Hawthorn. 6. Visions By Shirl at 116 Hawthorn #C-2. 7. Colonial Beach Museum, 128 Hawthorn St.
8. Tides Inn B&B, 200 N. Irving Ave.
9. LaLa's Hair Studio (now Elle Vit Salon) at 215-A Washington Ave.
10. Coldwell Banker Elite Realty, 233 N. Irving Ave.
11. 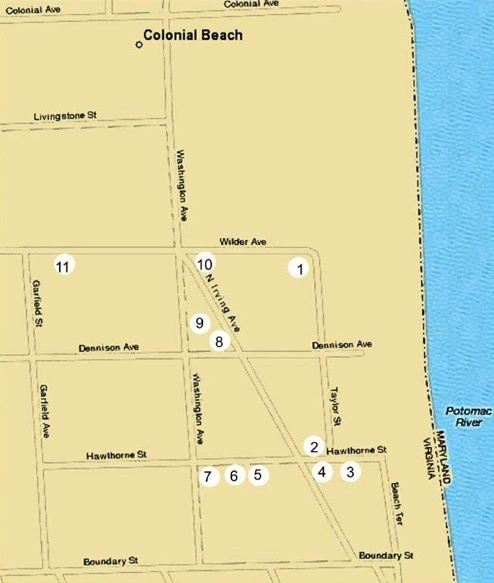 Griffin Gallery, 222 Wilder Ave.
Other participating locations include/have included Bay Haven Landscape Design Studio, Espresso Station (The Tattle Tale Cafe) at 215 Washington Ave., Fat Freda’s (Kelsea's Kitchen) at 119 Hawthorn, the Lighthouse Restaurant & Lounge at 11 Monroe Bay Ave and more. One fine spring day I hopped on my bike and made a few stops on the route to see some of the amazing works by these incredibly talented artists. One of the places I visited was the Wide River Gallery, (now Attica) and there was a good crowd in attendance, admiring the items on the gallery walls, talking and snacking on some yummy appetizers. At the Jarrett Thor Gallery I was blown away by an amazing Giclee print of The Bell House B&B, former home of telephone inventor Alexander Graham Bell. It was just stunning. Come out on the Second Friday of each month between 6 - 9 p.m. and join in the fun!